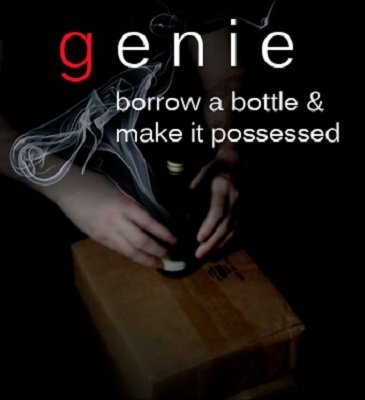 Possess someone's bottle with a genie. When you uncover the mouth of the bottle, the bottle starts moving because you stirred up the genie inside. Must-see video. Gimmick is super easy to make and you will only spend $2 or less at the local convenience store to make the gimmick or you may already have the required item. Suitable for stroll-around and street magic, if there is a surface nearby. "If you are wanting to move a bottle, but hate thread work, genie is definitely something to check out, I love it" - Cody D.